SupIRCam was decommissioned at the end of July 2010 following a failure of the cooling system. It will be replaced by the infrared channel of our new instrument IO:I in late 2011. This page has been left accessible in the short term for reference purposes but please note that it is no longer to schedule any SupIRCam observations. Contrary to the other imagers, SupIRCam requires you to obtain matched dark frames along with all your science observations. For every on-sky exposure run you request, you should include a dark exposure of the same integration time immediately before it. The data pipeline will identify and use this dark frame in the reduction of your data but the dark must be placed immediately before the exposure. If you use the sequence wizard then these darks will be created for you automatically. It actually brackets your observation with a dark frame both before and after. You only need to create them explicitly for yourself if you elect to use the general observation sequence editor. All SupIRCam observations are automatically dithered on a 7arcsec grid in order to allow rejection of bad pixels and creation of a clean sky image. On the exposure specification dialogue you enter only the individual exposure integration time and the number of frames to take. The instrument uses a 3x3 grid of nine pointings and simply cycles through this sequence as many times as is required to fulfill the requested exposure count. For example if you request 18x1sec then the instrument will cycle through its full 9-position dither pattern twice eventually obtaining two observations at each position. Where the exposure count is not an integer multiple of nine you simply get an incomplete portion of the 9-point dither. For example, requesting 5x1sec generates a cross shaped dither on the sky since the first five positions of the dither pattern are designed to scribe a cross. There are figures illustrating these dither patterns on the phase 1 instructions web page. (SupIRCam phase 1 instructions have been removed). For example, the following sequence tiles a sky region 4.7'x1.7' centred on the target position. The sequence uses two offset commands to create three separate telescope pointings separated by 1.5arcmin. At each of these three pointings the instrument will obtain a nine-frame exposure run using the 7arcsec dither pattern. Use the same "Multicolour Photometry" wizard as for RATCam and RISE. In fact a single observation sequence is free to contain exposures using any or all of the imaging cameras. Though it is not strictly required, it is more efficient to perform all observations required with one particular camera before switching to the next. Slew to target. Only one target is allowed per group. A configurable sequence of science target observations using any of the imaging camneras. The wizard dialogue screen offers the following options. This sets how the primary axis of the instrumentation payload derotator will be aligned with respect to either sky or the mechanical axes of the telescope itself. CARDINAL places the primary axis of the instrument payload on one of the cardinal sky orientations N, E, S or W though you cannot control which one. The telescope automatically chooses the field orientation best placed at the time of the observation in order to give the longest available observation duration without encountering the axis limits. Since SupIRCam is mounted on the telescope aligned with the payload's primary axis, this means in turn that the sides of the SupIRCam field will always be aligned N,E,S,W. Although the field orientation may vary between repeated observations of the same target, it will always be one of the four cardinal orientations and since the camera field-of-view is square will always cover the same area of sky, simply rotated on the chip. MOUNT explicitly sets the mechanical mount angle of the cassegrain derotator. Since you do not generally know the exact time the observation will be performed you do not know what sky rotation angle this will provide. Limits are -90 < MOUNT ANGLE < 90. This option is rarely used. Do not autoguide with SupIRCam. Exposure runs on SupIRCam always include implicit dithers which are described in detail above. Because of these dithers you cannot use the autoguider in conjunction with SupIRCam. The autoguider and automated dithers would conflict with each other. In practice you never want to autoguide SupIRCam anyway because individual integrations are never longer than 20sec. If you use the wizard it will allow you to select guiding modes but will automatically disable the autoguider during the SupIRCam observations, re-enabling it afterwards if you have other guided observations in the same sequence using other instruments. The system automatically applies all offsets required to keep the instruments and filters in focus. Only explicitly apply DEFOCUS when you want your data to be defocused. See Sequence Builder for detailed discussion. The SupIRCam reduction pipeline requires collection of dark frames along with all science exposures. The wizard will automatically include the required dark exposures for you. Contrary to other imaging instruments, when you select a SupIRCam configuration, the dialogue screen automatically adjusts to present a drop-down list offering only 1, 2, 5, 10 and 20 seconds. Individual exposures longer than 20sec are not allowed because they risk saturatimg the array from just the sky and thermal background even without any flux from your target. The "is standard" flag optionally adjusts the FITS filename to signify a standard calibrator rather than a science target. This has no effect on the way the observation is performed and provided only as a convenience if the user wishes. The common reason you are likely to want to use the SequenceBulder in preference to the wizard is to combine imaging and spectroscopy in the same group or to obtain observations of multiple targets within a single group. This latter case might be because you have an extended source and want a clean, uncontaminated offset sky field. There may of course be any number of other much rarer reasons why you might elect to use the sequence editor. These could include a series of observations of a target at varying degrees of defocus or a series of different derotator mount angles. None of these requirements are common but illustrate the flexibility afforded by the sequence editor. See Sequence Builder for a general description of all the available functions and Sequence Builder Tutorial for an introduction to using the sequence editor. The following points provide SupIRCam specific guidance when using the sequence editor. Issue a SLEW command followed by FOCAL PLANE = SUPIRCAM in order to place the target on the centre of the array. There is no need for any FINE TUNE command. See comments on Rotator Setting above. Do not autoguide with SupIRCam. You should include darks. See text description above for full details. There is no requirement for bias frames, arcs or flats and if obtained, none of these will be used by the automated data reduction pipelines. For SupIRCam this would mean a sequence of exposures all with the same integration time and instrument configuration but with the telescope automatically dithered by 7arcsec between each frame. See Dithers and Mosaics above. Do not use individual exposures longer than 20sec since these would lead to array saturation from just the sky and thermal background even without any flux from your target. We recommend only using the discrete integration times offered by the wizard; 1, 2, 5, 10 or 20 seconds. 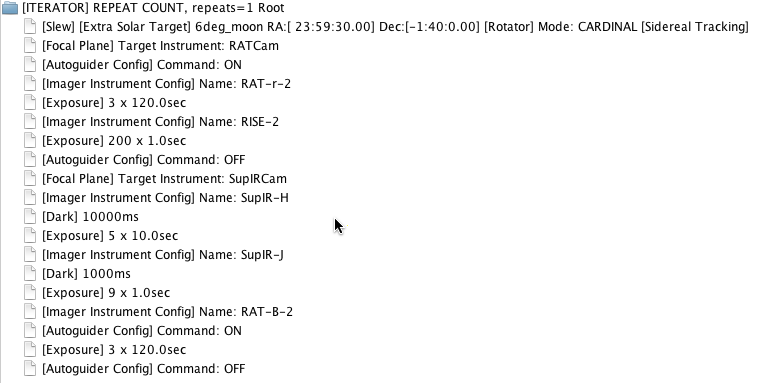 The following is an example of a group created using the sequence editor using all of RATCam, RISE and SupIRCam. Note the correct placement of dark frames and the autoguider being disabled during the SupIRCam exposures. It should be noted that this group could have been more easily created simply using the wizard.